On January 9, Iain Small and Uisdean Hawthorn pulled off an important repeat when they made the second ascent of Crusade (VII,8) on Church Door Buttress in Glen Coe. 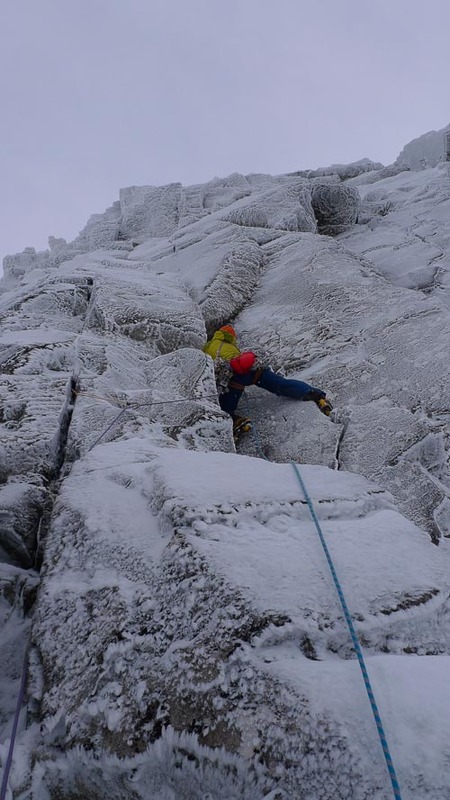 “After climbing up on Church Door Buttress in summer 2013 I had liked the look of the line Sam Chinnery and Steve House climbed during the BMC Winter Meet of 2005,” Iain told me. “It’s the furthest right of the winter lines before the buttress becomes dominated by the great summer Extremes. Up on the Ben after Hogmanay on a windy day of iced cracks and spindrift, we came across a solitary Yank foiled in his pursuit of taking photographs of his fellow climbers. They were on Knuckleduster and it looked unhelpfully verglassed. ‘Who are they?’ we enquired. ‘Steve and Josh,’ came the reply. So it was Steve House – that explained a lot! This entry was posted in Repeats and tagged Bidean nam Bian, Iain Small, Uisdean Hawthorn. Bookmark the permalink.